The United Kingdom-based publication Acquisition International has presented geoAMPS with a 2016 Offshore Excellence Award. The award is for Best E&P Project Management Software: landAMPS. 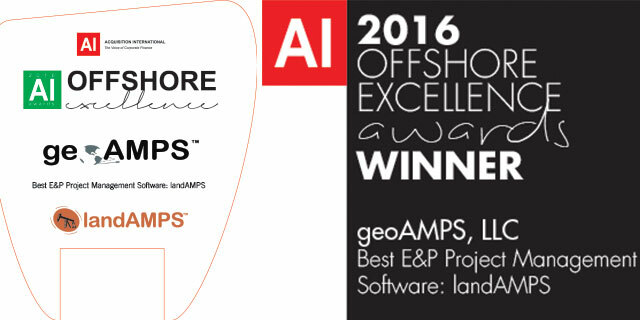 A description of landAMPS and information about geoAMPS appears in Acquisition International's Offshore Excellence Awards supplement. One of the suite of industry-specific software products offered by geoAMPS, landAMPS meets the needs of oil and natural gas producers. geoAMPS software has been proven effective in drastically reducing the timeline for oil and gas projects, which can result in millions of dollars of added revenue. landAMPS is effective in managing mineral rights in oil and gas E&P. With landAMPS, oil and gas companies manage fast-paced lease acquisition and costly drill schedules. It also is useful in managing workflows of crews onsite. geoAMPS is the premier provider of software solutions to manage land rights and infrastructure assets. Its clients are leaders in their respective industry. geoAMPS clients include some of the largest oil and gas producers in the world. geoAMPS solutions are available across Web, mobile and GIS platforms, providing maximum flexibility and deployment options. Acquisition International is a monthly magazine published by AI Global Media Ltd., a publishing house that has reinvigorated corporate finance news and reporting. Acquisition International has more than 108,000 subscribers in 170 countries. The publication maintains a vigorous online presence. Its website is updated daily with the latest news, features, opinion and commentary regarding the global corporate landscape. Acquisition International selects Offshore Excellence Awards annually. Dan Liggett is Communications and Public Relations Consultant for geoAMPS.